The first cloud based, highly secure, paperless earth moving & material supply platform. For construction companies, subcontractors and truck drivers alike. Join the community of construction companies, subcontractors & truck drivers using TruckPay today. Highly secure complete enterprise solution that manages all aspects of earth moving logistics. It’s Thursday and you can’t find the ticket you received for the job on Monday and you are supposed to submit them on Friday? You cannot submit the ticket because it is missing the vital information required in order for you to get paid? ENOUGH! IT’S TIME FOR A CHANGE. Automate all aspects of earth moving logistics with TruckPay. Totally eliminate paper tickets; Keep your records in one safe place, where all tickets look the same, are visually date stamped, and have all of the detailed documentation you need to get paid. Exploit market opportunities. Request bids and receive competitive quotes in real time. Bid directly on the best jobs, on the ones you want. Validate invoices before paying them. If your not sure about some of them, no need to worry. A picture says a thousand words. Check the photos of all of the loads that are picked up and dropped off. Receive payments for outstanding invoices within 2 days of being paid. Always make a profit and stay on top of all of your earth-moving costs. Completely eliminate the use of paper tickets to track material pick-ups and drop-offs with TruckPay’s patent-pending QR code scanning technology. Instead of having someone hand out paper tickets at a job site, your site supervisor can now simply scan each driver’s iOS or Android device with his iOS or Android device and confirm the pick-up or drop-off. Your independent drivers and subcontractors will also be very happy, because they won’t have to worry about losing tickets or not having the ticket properly signed and then not getting paid. Quickly get the drivers you need, at the most competitive prices, with the TruckPay Job Board Service. Instead of spending lots of time trying to find the trucks you need for a job, the TruckPay JBS allows you to easily post the job, with either a fixed price or by soliciting bids from interested drivers. You can then pick and award the job to the most highly ranked independent owner-operators and subcontractors, with the most competitive prices. Easily determine the price to offer for a fixed bid job or check that the bids you are receiving are competitive, by using the exclusive TruckPay Bid Calculator. 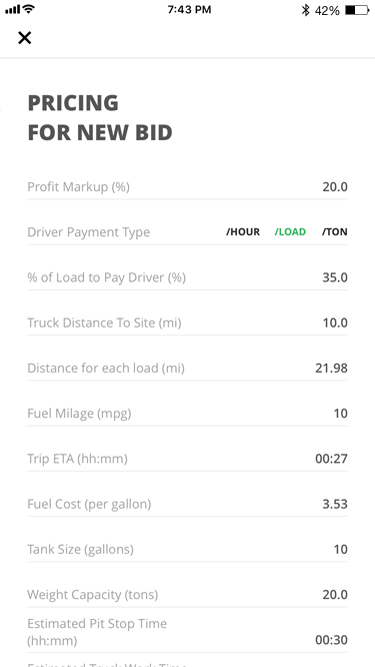 The bid calculator accounts for profit margin, cost of fuel, length of the delivery, type of truck being used, and even the wear and tear cost on the vehicle; it quickly calculates a per load, per ton, or per hour price, based on your job requirements and the level of profit margin that you’re willing to have a driver or subcontractor earn for this job. Validate invoices before paying them. Your accounts payable team can view the details of each load picked up and delivered and even see a time-stamped picture of the picked-up and dropped-off load prior to paying the invoice. Once it is determined that all deliveries are done as originally specified in the job request, you can click one button and pay all independent drivers and subcontractors for their work. You can also deny payment for specific deliveries, that weren’t done as requested, and specify the reason for the payment denial. Date & time of delivery, who scanned in the driver, name of the driver, material carried, how long it took to make the delivery and cost of the delivery. You can then rank your most productive drivers by the average time it took to complete all deliveries. TruckPay even allows you to distinguish between your internal company drivers and external owner-operators and subcontractors, to determine the most productive drivers on your entire team. The TruckPay Scan Reports can be customized to meet both Federal and State reporting requirements. This capability provides a competitive advantage when bidding on government work, as you can assure the government entity with whom you’re working, that you can account for and provide an audit trail for every invoiced delivery. Tired of losing those annoying paper tickets and not getting paid for your hard work? 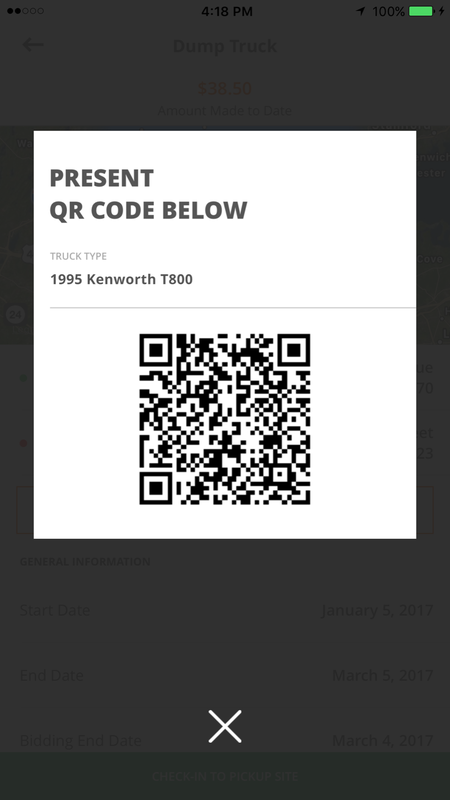 TruckPay’s paper ticket replacement, patent-pending QR code scanning technology makes that a thing of the past. We know when you’ve delivered a load and even have you take a picture of the load at pick-up and at drop-off, We make sure that the construction company or subcontractor for whom you’re working knows the pick-up and drop-off times and sees the pictures of the loads. And by doing this for you, there are virtually no disputes about whether you’ve done the job correctly or how much money you are owed. Feel like you’re not getting the best jobs? 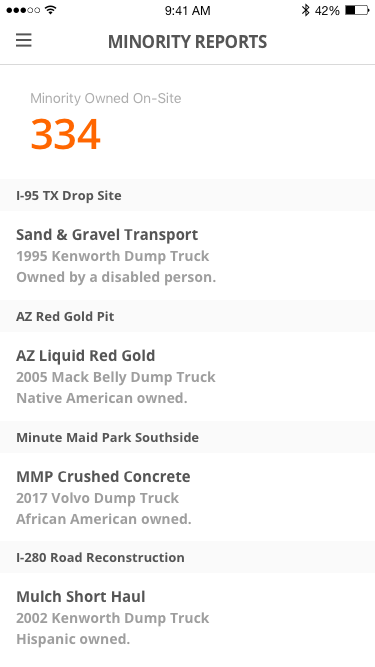 The TruckPay Job Board Service (JBS) allows you to see jobs in your defined work area and bid on jobs that you want. Once you are awarded the job, you will receive a unique TruckPay QR code. You can be sure that someone’s relative or friend can’t take the job away from you because they will not be able to work on a TruckPay site, unless they have received their own unique code. TruckPay only authorizes the requested number of trucks to work on a site, so you don’t have to worry if there are too many trucks on a site, as long as you have your TruckPay QR code. Think you’re making money on every load or job, but then when the gas, insurance, and maintenance bills come in, it feels like you were working for free? The TruckPay Bid Calculator allows you to profitably price every job, every time, so you can be assured that your hard work always pays off. The Bid Calculator helps you easily evaluate a price for a fixed bid job or it can provide a price to submit for a competitive open bid job. The bid calculator accounts for your desired profit margin, cost of fuel, delivery distance, type of truck being used, and even the wear and tare cost on the vehicle; it quickly calculates a per load, per ton, or per hour price, based on the specific job requirements. Want to know how much money you’re making in real-time as soon as you have dropped off a load? 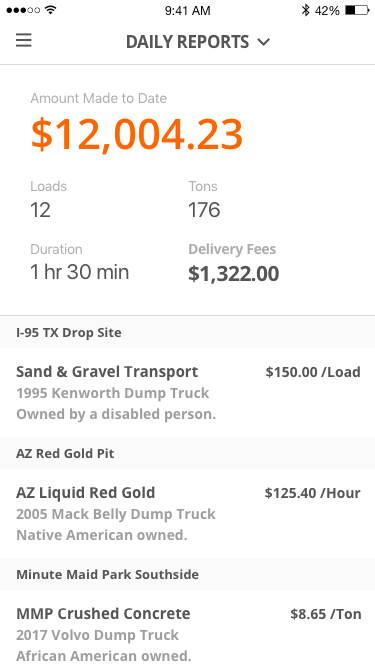 TruckPay continuously shows you how much money you’ve made for the day as soon as you’ve successfully dropped off the load. Tired of having to cash a check at the end of every week? The TruckPay system will automatically deposit your hard-earned money into your account or load it to your debit card as soon as the construction company or subcontractor has paid the invoice. Earlier payment options are also available. You will be notified when an invoice is coming due and after it has been paid and will be able to view all of your previous invoices. To see how business has been going for the week or month or for the quarter. Ever wonder who are the best companies to work for and how to maximize your valuable time? 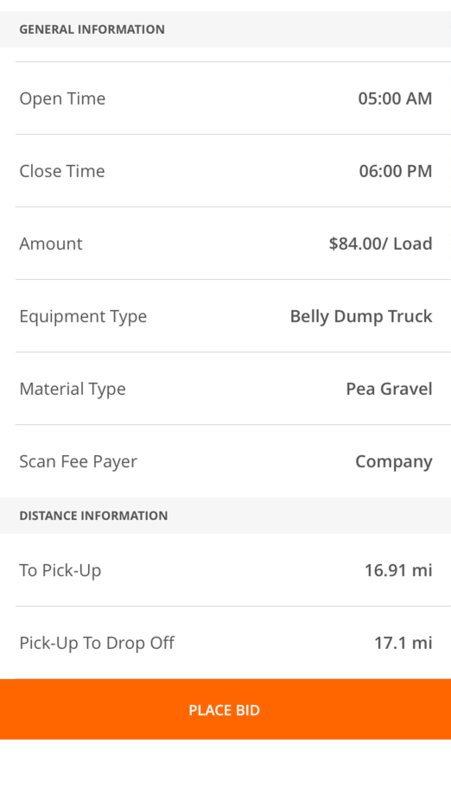 TruckPay will show you, in real-time, the loads you’ve picked-up and dropped-off, the material you carried, the sites where you’ve worked, and who checked you in and out of each site. You can even determine how long it took you, on average, to deliver each load and which sites were most profitable. TruckPay integrates with electronic scales so that drivers never have to leave their trucks to get their scale tickets. Automated scale integration creates a safer work environment and improves the operational efficiency of the job. Dispatchers and senior managers can see, in real-time, how many tons the driver has actually picked-up. Drivers are given explicit instructions as to whether they are to get weighed for the tare weight of the truck and then weighed for the gross weight, or to only get weighed once, if just a gross weight is required, depending on the job requirements. If the scale isn’t electronic, the driver types in the weight registered by the scale and then takes a picture of the actual ticket. Dispatchers can still see the amount of material picked-up, in real-time, but will also have an actual image of the scale ticket, ensuring that the weight is legally recorded. 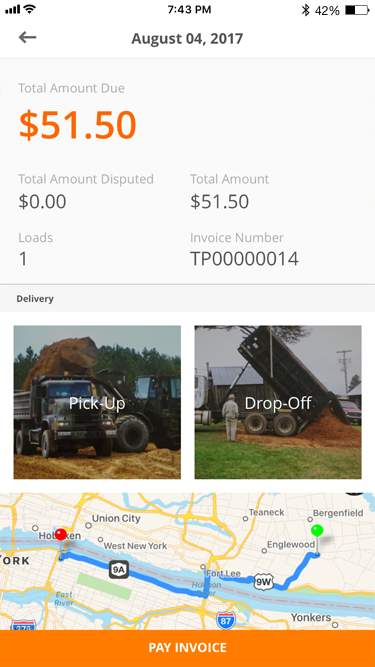 TruckPay is the first platform that eliminates paper tickets from the earth moving industry and provides total transparency and accountability to drivers, subcontractors and construction companies. Everyone knows what everyone is supposed to be paid, and that they have been paid. Is TruckPay a free platform? 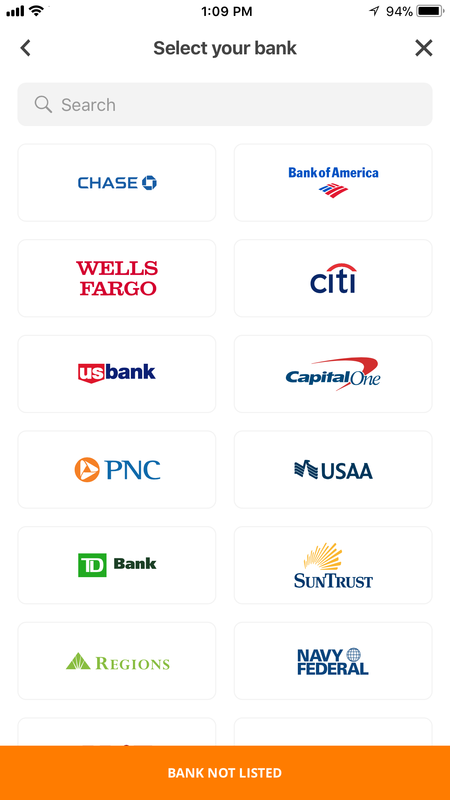 The TruckPay app can be downloaded for free on the iOS App Store as well as the Google Play Store. Users only pay for those services that they need and use. 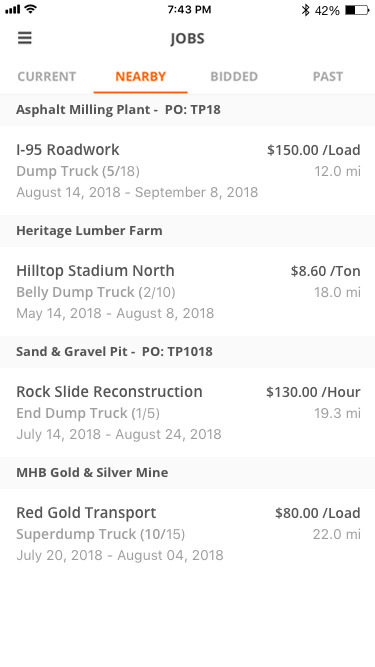 TruckPay's patent pending paper ticket replacement technology allows a construction company or subcontractors to quickly automate their job sites. Solicit bids in real-time for any size job, and get the best pricing from independent operators and subcontractors. Subcontractors and drivers can bid on the most lucrative jobs (you now have a friend in the dump truck business). If you are an independent owner operator, we recommend signing up or logging in to TruckPay on the TruckPay app either on your iOS or Android device. 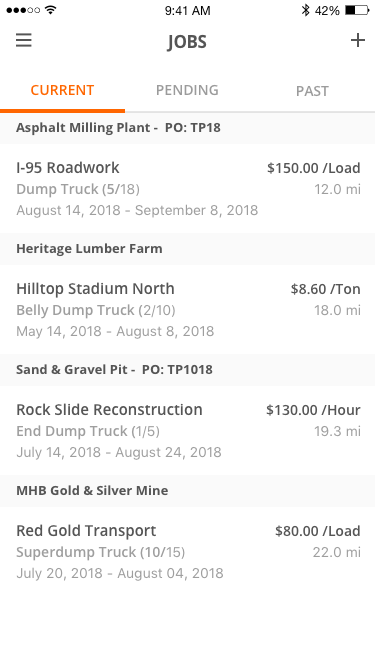 If you are a construction company or subcontractor, we recommend either signing up or logging into the platform on your mobile device, or the TruckPay web platform on your desktop or laptop computer. Alternatively, if your company has just started using TruckPay, you must receive an email invite from your TruckPay company administrator to sign up for the platform. What if I don't have a smartphone? Can I still use TruckPay? If you are an independent owner operator, you will need an iOS device, running iOS 10.0 or greater, or an Android smartphone. If you are not working in the field and just want to view reports, invoices, and solicit and award bids, then you may use our web platform on any laptop or desktop computer. If you have any questions, or are experiencing any kind of issues while using TruckPay, please, do not hesitate to either email us or call us at +1-877-TruckPay. We are always here for you. Why use TruckPay if I am a government entity? TruckPay's patent-pending technology to replace paper tickets, online job board service to solicit bids from a variety of subcontractors and independent owner operators, truck tracking, automated payments, minority company participation reporting, and productivity metrics reports and permissioning system provides the highest level of transparency, security, and auditability possible in the earth moving and material supply logistics industries. The taxpayers will thank you, as you will be able to ensure that no work is paid for, that hasn’t been completed according to specifications. You will also be able to monitor the cost of projects, in real-time, to ensure that they are completed on budget and on time. Why use TruckPay if I am an independent owner operator driver? 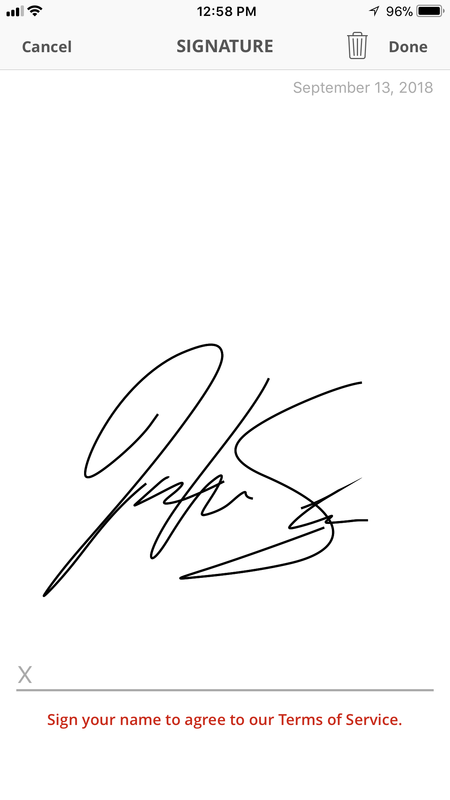 The TruckPay platform removes the worry about losing a paper ticket or not being paid for a properly signed ticket again. You will know exactly how much money you have earned every day and will have the proof you need of the work you completed. You will get paid in a timely basis and the money will be put in the account of your choosing. You can see which are the best companies to work for. Why use TruckPay if I am a Construction Company or a subcontractor? TruckPay's QR code scanning technology eliminates the need for paper tickets - you will no longer need people to count tickets or worry that you have received fraudulent tickets. 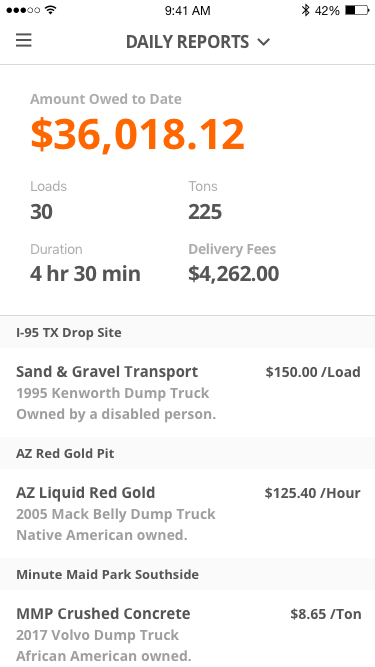 You no longer need to wonder where your drivers are and what is taking them so long to make a delivery; trying to find drivers quickly to do your jobs is now seamless by using the TruckPay job board service, and getting the best price for a job is now made easy by being able to use the Job Board Service to solicit and award bids in real-time. Paying your drivers and subcontractors can now be done with the tap of a button after your accounts payable team has validated that all deliveries were done according to specification. Barry S. Honig, the firm’s CEO and his son, Benjamin M. Honig, the company’s CTO co-founded TruckPay in October 2015. Everyone knows, what everyone is supposed to be paid, and that they have been paid. Barry learned about the intricacies of the earthmoving business when he went down to Texas and bought his nephew, Mitchel, a dump truck. Barry listened to first hand stories about the use of paper tickets to document load pick-ups and drop-offs. He heard about drivers and subcontractors sitting in fast food restaurants, counting and validating hundreds of paper tickets. He also picked up stories about the potential for fraud, how drivers would make up their own tickets for loads that were never done. Clearly, there was an incredible amount of inefficiency in using paper tickets, and being a technologist himself, the wheels started turning. Barry realized that the problem of paper ticket replacement in the earth-moving industry was identical to one he had worked on nearly twenty years ago on Wall Street, replacing paper stock trading tickets with an electronic trading platform. Barry asked Benjamin, who was a senior in college at the time, if there was something like E-ZPass on iPhones to replace paper tickets. Benjamin said, “No,” but suggested using QR Codes instead. Realizing the need for an alternative to paper tickets, Barry set out to design an earth moving logistics platform. This multi-faceted platform not only replaces paper tickets with QR codes, it provides construction companies and subcontractors with an efficient way to find drivers to work on jobs. Drivers have a convenient market place to find and bid on the best jobs and companies can quickly validate and pay their drivers and subcontractors for work performed. Barry suggested they team up and combine Barry’s large-scale system design and analytic expertise with Benjamin’s user interface skills. The combination was natural, and after Benjamin graduated, the work began in earnest to build the world-class logistics platform that TruckPay now offers today. Barry S. Honig is responsible for designing and providing the business analysis for the platform, raising investor funds, investor relations, and for running day-to-day operations. Mr. Honig is a graduate of Columbia University School of Engineering, with a degree in Applied Mathematics and graduate work in Computer Science. He brings 34 years of work experience to the organization. As President of Honig International, a well-known management consulting and executive search firm, he focuses on the needs of the financial services and payment industries. Mr. Honig is uniquely positioned to understand the current technology trends in these industries and has a deep understanding of how to identify and quickly acquire talent for TruckPay. Mr. Honig has also worked as a Senior Technology Manager for firms like Morgan Stanley, as Principal and head of FX, Commodities, and Global Credit Risk Management Technology. 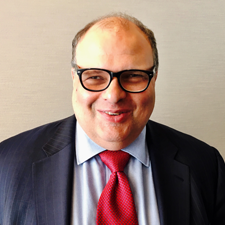 Mr. Honig has also worked as a Risk Management Consultant for several global banks, and as a licensed CTA and CPO (Commodity Trading Advisor and Commodity Pool Operator), managing over $34M of investor assets. Mr. Honig has also served as an Adjunct Professor of Finance at New York University. He is also a former owner of an earth moving logistics business and has an insider’s view of the needs of this industry. 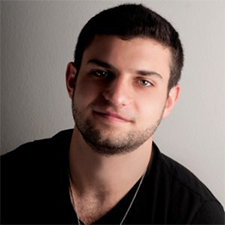 Benjamin, a recent graduate of the Syracuse University iSchool, class of 2015, is a two-time Apple World Wide Development Conference (WWDC) Student Scholarship winner. He has developed more than fifteen apps for the Apple App Store and has been writing software and managing global technical resources since the age of 15. A few of Benjamin’s more successful apps are Poké Quiz for Pokemon and iRon Dome. Poké Quiz for Pokemon allowed Pokemon enthusiasts to guess the name of the Pokemon characters as they were flashed on the screen. This app has had over 895,000 downloads. iRon Dome provides real-time iPhone alerts to Israelis when a missile is launched into Israel. The app indicates where the missile is likely to land so that people can seek shelter and safety. Benjamin developed this app with another individual, who did the server side engineering. This application won high praise in July 2014 when the Times of Israel published an article on them in its Sunday New Startup Companies section. TruckPay, Not Just Ground Breaking, Earth Shaking™, is a highly secure complete enterprise solution that manages all aspects of earth moving logistics. Message or call us if you have any questions or concerns.